Go to www.PhilosophyInAction.com on Sunday at 8 am PT / 9 am MT / 10 am CT / 11 am ET to watch me answer this question live and join in the text chat. If you're not able to join the live webcast, an audio recording of my answer will be posted in the webcast archives on Sunday afternoon or Monday morning. Be sure to check out the other questions on tap for this week's webcast too. I'd love to hear your own answer to this question! Please feel free to post it in the comments. Religions are better or worse in their core doctrines and in their effects on a culture. However, due to the complexity of religions – not merely as ideologies but also as a cultural movements – they can't be easily judged as better or worse. Also, just because a person claims to be an adherent of a given religion doesn't tell much about what he believes or practices, nor whether they are honest. This is why I take abortion rights so seriously and so personally. If a politician can't understand and respect my right to control my own body, then I can't trust him to respect any of my rights. For further details, see Ari Armstrong's and my recently-published essay, "The Assault on Abortion Rights Undermines All Our Liberties. ... If rights were somehow inherent in man by virtue of his being man, then we could never punish people who violate rights--because using retaliatory force against them would violate the "rights" that they "inherently" have and that they thus always retain by virtue of being human. Because Rand's theory is based on and derived from the observable requirements of man's life, it is not afflicted with contradictions regarding those requirements. On Rand's theory, rights are inalienable, in that others cannot take away or nullify one's rights; but they are also forfeitable, in that one can relinquish one's own rights by violating the rights of others. If and to the extent that a person violates the rights of others, he relinquishes his own rights and may be punished accordingly. His choice to violate rights places him outside the purpose of the principle and thus the scope of its protection. Again, one cannot claim the protection of a principle that one repudiates in action. 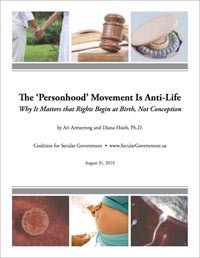 If rights were inherent in human nature, based purely on DNA or species-membership, then the advocates of "personhood for zygotes" would be right: the fertilized egg would have a right to life. However, on an objective theory of rights, rights cannot apply until the fetus is biologically separated from the woman. Only then does the fetus -- then a baby -- enter the social context necessary for rights. For further details, see Ari Armstrong's and my recently-published essay, "The Assault on Abortion Rights Undermines All Our Liberties.